Make sure the parking brake is applied. 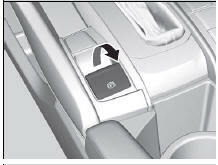 The electric parking brake indicator comes on for 15 seconds when you pull ►p the electric parking brake switch. Check that the shift lever is in P, then depress the brake pedal. Although it is possible to start the vehicle in (N, it is safer to start it in P.
Check that the shift lever is in N. Then depress the brake pedal with your right foot, and the clutch pedal with your left foot. The clutch pedal must be fully depressed to start the engine. Keep your foot firmly on the brake pedal when starting the engine. The engine is harder to start in cold weather and in thinner air found at altitudes above 8,000 feet (2,400 meters). When starting the engine in cold weather, turn off all electrical accessories such as the lights, heating system*/climate control system*, and rear defogger in order to reduce battery drain. If you live in a region where winter is extremely cold, an engine block heater will improve starting and warming of the engine. Consult a dealer for details. If the exhaust system sounds abnormal or you can smell exhaust gas inside the vehicle, have your vehicle checked by a dealer. There may be a problem with the engine or exhaust system. Turn the ignition switch to START without depressing the accelerator pedal. Do not hold the key in START for more than 10 seconds. If the engine does not start right away, wait for at least 30 seconds before trying again. If the engine starts, but then immediately stops, wait at least 30 seconds before repeating step 3 while gently depressing the accelerator pedal. Release the accelerator pedal once the engine starts. The immobilizer system protects your vehicle from theft. If an improperly coded key (or other device) is used, the engine's fuel system is disabled. 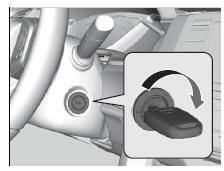 Keeping your right foot on the brake pedal, put the shift lever in D. Select R when reversing. With the parking brake applied, release the brake pedal and gently depress the accelerator pedal. Make sure the parking brake indicator goes off. 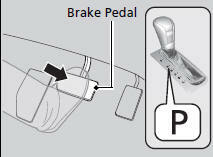 You can also release the parking brake by pressing the electric parking brake switch while depressing the brake pedal. When facing downhill, you can start your vehicle more smoothly by manually releasing it with the electric parking brake switch than by releasing it with the accelerator pedal. Hill start assist keeps the brake engaged briefly to help prevent the vehicle from rolling on inclines as you move your foot from the brake pedal to the accelerator. 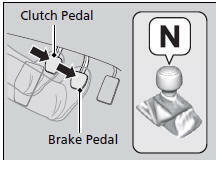 Move the shift lever to D, S, or L when facing uphill, or R when facing downhill, then release the brake pedal. Hill start assist may not prevent the vehicle from rolling downhill on a very steep or slippery slope, and does not operate on small inclines. Hill start assist is not a replacement for the parking brake.